Notice the bright orangey 'Pin Cushion' like bloom? 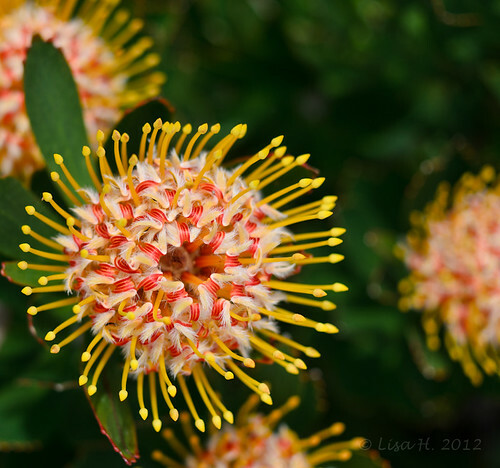 That is the exotic Proteas (click here to see the bigger version...). Even weeds look pretty in Spring... can you spot which is the weed? Using hand held beater, beat butter and sugar till light and fluffy. Add in egg. Mix well. Add in twice sifted plain flour mix (sift with baking powder) and lavender flowers. Spoon into a piping bag and use a 8mm nozzle and piped onto baking tray lined with greaseproof paper. Alternative ~ spoon straight onto lined baking tray. Leave it to cool before decorating with Royal Icing. So pretty and delicate looking! 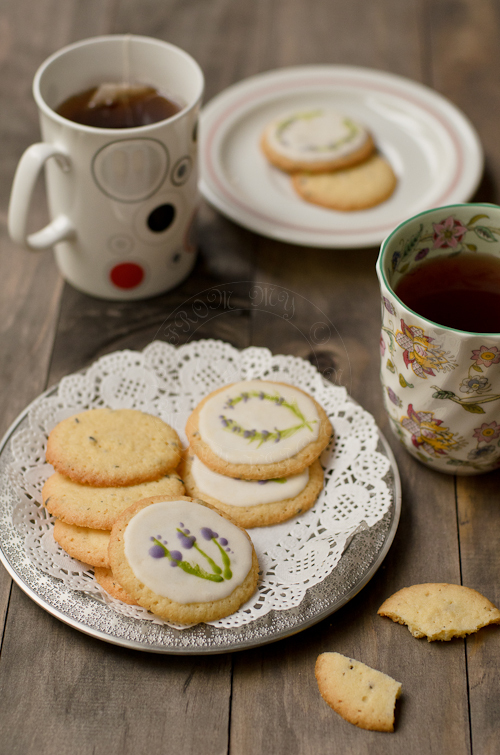 Aren't the lavender cookies look too good to eat! Just wonder how much care you have showered your garden : ). Thanks for sharing! ooo...loving the artwork on your cookies!! Your garden is full of activities! Gorgeous cookies! First of all, you've so beautifully captured the essence of the season in your photographs. Just lovely. Hi Lisa, wow...cantik molek, the design on the cookies so cute and pretty. You're excellent. Beautiful flowers from your garden, they sure look gorgeous. Pretty, Pretty, Pretty biscuits. Makes teatime a joy! Your cookies look so good! I've never used lavender, but it looks amazing. Beautiful plates and cups, too. I love the delicate patterns on the cookies! Everlastings are not weed... they are gorgeous planted in abundance.. I absolutely love how you've decorated the cookies! Simple Beautiful! I will have never have patience to do such a thing i think.